To convert from DV video you may need to install the Panasonic DV Codec. To convert from DivX/XviD video you have to install a DivX/XviD Codec, you may need both DivX 3.11 and the DivX 4 or 5. To convert from QuickTime MOV videos you must download the QTReader.vfp and copy it to the TMPGEnc folder. 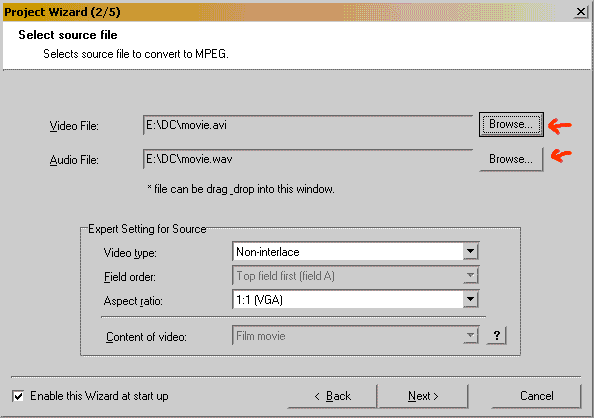 To convert from MPEG2/SVCD/DVD videos you may need the MPEG2 Plugin or a MPEG2 Codec/Player. To convert from DivX/XviD with AC3 Audio install the AC3 ACM Decompressor. To convert from MKV install the matroska / MKV Codec. To convert from OGM install the OGG Vorbis DirectShow filter/ OGM Codec. If you receive any errors or have problem opening files in TMPGEnc be sure to read the TMPGEnc Common Problems. Install TMPGEnc by extracting all files in the zip file to a folder. Now start TMPGEnc and open the Wizard(under File->Project Wizard if you have closed it). PAL if the video source is 25 frames/sec (FPS). Here do we select the source video. Open the video by clicking on Browse. The audio will be opened automatically(If you have a different audio source then choose it manually). Note 1! If your source is DivX,XviD, ASF or SMR it is best to extract the audio separate to a wav with Virtualdub because TMPGEnc can not handle all audio sources that well(causes sync problems). 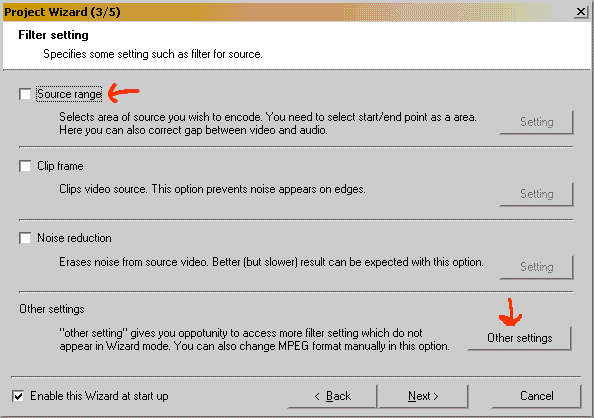 But if you are converting from captured material such as DV,Huffyuv,MJPEG you can leave the audio same as the video. Note 2! If you get an error when opening the video read here. Note 3! 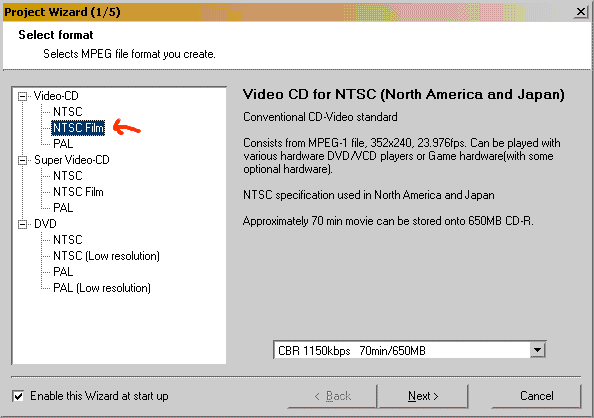 If your video source is 23,976 fps then check so it says Film movie under Content of video, if not then go one step back and select NTSC Film(Use virtualdub to check the source fps, read here how to). Here we can add filters and also both select source range and clip the video. If the movie is above 80 minutes as most are you must cut it. 2. and select start frame. 4. and select end frame. Select first the first half and add some more seconds so you will get some overlapping between the CDs. When encoding next part select exact from half to the end. Note, you can max fit 80 min a CD so if the movie is above 160 minutes you must cut in three parts and so on. Change the Video arrange Method to Full screen (keep aspect ratio) if you wan't the movie to look exact the same as the video source. 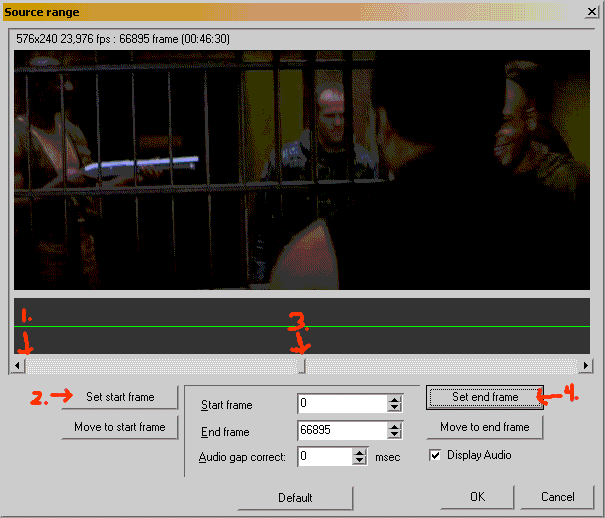 If you have a widescreen movie and you want it to be fullscreen(no borders) select instead No margin(keep aspect ratio) and TMPGenc will cut it. 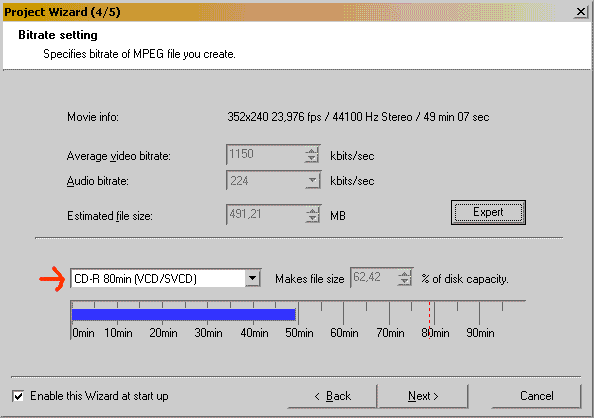 Here do we specify on what media you are going to store the video on, on a 74 min CD you can fit almost 74 min VCD video. Select CD-R 74min or 80min depending on what media you are going to burn on. 80min means that you can fit near 80 min on a 80min CD and 74 min on a 74min CD. If it won´t fit go back and cut so it will fit. Last Hit OK to start the first encoding. Repeat everything to encode the other part(s). Now you are ready to burn it to VCD. Convert the audio to WAV audio before converting and use the wav as audio source. This problem usually occurs when the audio is MP3 VBR or AC3 audio. Try first to change the directshow codec reader priority settings in TMPGEnc under Option->Environmental settings->VFAPI plug-in and right click on the DirectShow Multimedia File Reader and increase the priority to 2 or to the top of the plugin-list and try reopen the video. If that does not help be sure that you have installed DivX or XviD or MPG2 or DV Codecs, read here how to identify what codecs you need. Try to convert the audio to WAV audio before converting and use the WAV as audio source. (TMPGEnc can't handle VBR MP3 and AC3 that well). Read the audio to WAV audio guide . Write error occured at address 77F83AED of module "ntdlll.dll"
If that doesn't help try repair/fix the video source, you find video repair/fix guides here (Downloaded video files could have bad/corrupt video frames that could cause crashes). If TMPGEnc says Can't load P3Package.dll or P4Package.dll? Be sure that you have exctracted all files in the tmpgenc download zip file to a folder then go to that folder and start tmpgenc.exe or make a shortcut to tmpgenc.exe and it should work. Or try copy the p3package.dll and p4package.dll to your windows\system32 folder and restart TMPGEnc. Try change the directshow reader priority, in TMPGEnc under Option->Environmental settings->VFAPI plug-in and right click on the DirectShow Multimedia File Reader and increase the priority to 2 or to the top of the plugin-list and reopen the video. If that doesn't help try convert the audio to WAV audio before converting and use the wav as audio source. And if all that didn't help you can always use the source range to select exact what to encode, under Settings->Advanced in TMPGEnc. 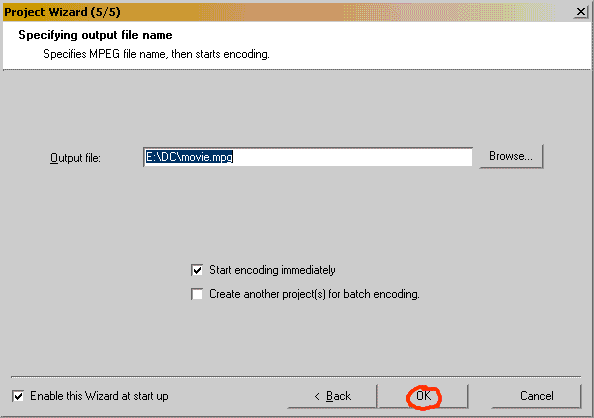 How do I encode several video files to one MPG video file? Can I open several video files with TMPGenc? How do I open an image sequence(DCP_0001.JPG, DCP_0002.JPG,DCP_0003.JPG ...)? In TMPGenc under Option-> Environmental setting-> General, check the box for "Open sequence files as a movie". And then rename your movie source files like video1.avi, video2.avi, video3.avi (same name but with a number at the end) and all will be opened at once with TMPGEnc. Note that all files must have same video and audio settings. How do I convert video with AC3 audio? Install the AC3 ACM Compressor and you can convert AC3 audio. If you are making DVD you don't have to convert the AC3 audio at all, you can leave it as AC3 and only convert the video, read this guide. Load your VCD,SVCD or DVD template or use the wizard as usual, then load the unlock template that you find in the extra folder in the templates folders. Now you should be able to change every setting. You can also right click on the setting word and choose Unlock. 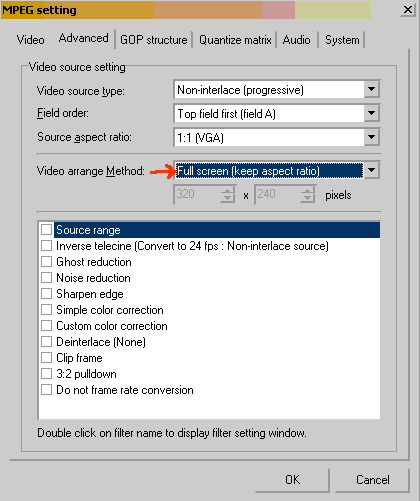 Be sure to select under Settings->Advanced under Video Arange Method: Full Screen(Keep aspect ratio). Try and rename it to .asf and open it. If that doesn't help try to change the directshow codec reader priority settings in TMPGEnc under Option->Environmental settings->VFAPI plug-in and right click on the DirectShow Multimedia File Reader and increase the priority to 2 or to the top of the plugin-list and try open the video. First install a DV Codec and be sure that you can play DV AVI with Media Player. Then try change the directshow reader priority, in TMPGEnc under Option->Environmental settings->VFAPI plug-in and right click on the DirectShow Multimedia File Reader and increase the priority to 2 or to the top of the plugin-list and reopen the video. If that doesn't help you may need to convert the DV to Canopus reference DV (TMPGEnc do not support Microsoft DV AVI 1). If the source is in WideScreen and you want it to be in FullScreen you just select under Settings->Advanced under Video Arange Method: No margin(keep aspect ratio) and TMPGEnc will then cut left and right so it will fit FullScreen. You find other MOV to converting tools here. Then try to change the settings in TMPGEnc under Option->Environmental settings->VFAPI plug-in and right click on the AVI VFW and increase the priority to 2 and try reopen the video. You can use an external audio encoder because TMPGEncs own audio encoder is not the best. One of the best audio mpeg layer 2 encoders is tooLame, download and extract all files to a folder. In TMPGEnc under Options->Environmental Settings->External tools select Layer 2 and browse for the toolame.exe. More info about each settings in TMPGEnc do you find in the TMPGEnc Explained guide by Shocan.